That’s how Americans do it, and no doubt they’ll manage to succeed. MAXSpeed Group, US Rotax distributor have decided they want a US champion in 2012 Grand Finals to cap the brilliant work done so far to boost the Rotax program in the US. So, to make it happen, MAXSpeed is raising the bar with a juicy cash reward of $10,000 to the first American Rotax Grand Finals Champion. It certainly is a great incentive to increase participation in national Rotax series, and for American Rotaxians to give that extra bit to be on top at the next Rotax Grand Finals to be held in Portimao (Portugal) on 27/11 – 01/12 2012. Something which seemed to lack last year in Al Ain, where despite a line-up of 10 drivers in the four categories, Team USA only managed to bring 5 in the final stages, with Stepanova Nekeel hitting the best placement of the lot finishing 5th in Senior. So Garry Lobaugh & co. set to find the first American Rotax world champion without hesitation in 2012. 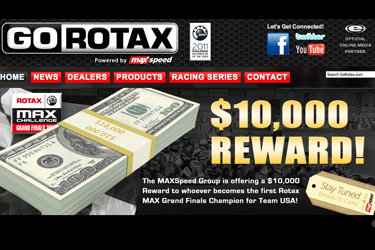 In line with the strong promotion of the Rotax program, MAXSpeed also launched the new version of GoRotax.com, the official website for the United States Distributor for all Rotax Max engines and products, as well as the official home for all information regarding the Rotax Max Challenge United States (RMCUS). Last but not least, the MAXSpeed Group announced the host track for the 2012 Pan American Challenge. The Track at Centennial in Englewood Colorado will be the host track of the 2012 Pan American Challenge on September 20th – 23rd, 2012.